For weekly exfoliation and blackheads removal. Peel, cleanse, nourish and pat modes 4-in-1. 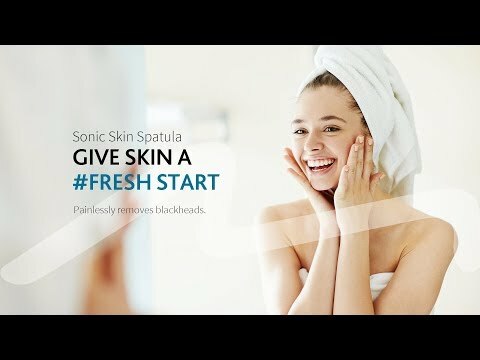 How the MiLuxy Sonic Skin Spatula Works? Watch and understand how MiLuxy Sonic Skin Spatula easily removes dead cells and impurities upon water vaporization. We transfer this technology from SPA machine to wireless portable device for home use. Feel the results right after first use. Provides a convenient and pain free solution for people with blocked pores. Look clean and refreshed all the time. No need for face scrubs, achieve superior results using only water. Stay environmentally friendly even when doing your beauty routine. Quickly restores the appearance of healthy, youthful skin. With glowing skin, you’ll be ready to go right after use. The peeling mode provides 1.68 millions vibrations per minute to induce water vaporization that effectively removes blackheads, dead celles, trapped oil and dirt. It performs natural exfoliation with only water and the result is far superior to using any chemical scrub. Feel immediately smooth skin right after first use. The MiLuxy Sonic Skin Spatula performs peeling, makeup removal, nutrient nourishment and patting in one device by advanced sonic vibration and ionization technology for deep cleansing and max absorption of skincare products. The blade is made of food-grade stainless 304. It is not sharp but can easily scrub blackheads and trapped oil from the depth of the pores. Simply wipe the blade clean with alcohol swab and dry clean cloth. Handheld size and USB rechargeable battery making it comfortable and convenient to use the device anywhere: home, SPA center, gym or while traveling. To relax tiring eyes and soothe wrinkles, eye bags and dark circles anytime, anywhere. Deep cleansing, intensive moisturising and lifting all-in-one. For complete remove of residual makeup and impurities to prevent acne and dullness.